Israel has revealed plans to build nearly 1,300 housing units for Jewish settlers in occupied East Jerusalem. Building settlements is seen as illegal under international law and the issue has stalled recent efforts to revive Israeli-Palestinian peace talks. The announcement comes as Israel's Prime Minister, Benjamin Netanyahu, is on an official visit to the US. The US and the UN criticised the move, while Palestinian officials said it was an attempt to sabotage the talks. "We thought that Netanyahu was going to the United States to stop settlement activity and restart negotiations, but it is clear to us that he is determined to destroy the talks," chief Palestinian negotiator Saeb Erekat was quoted as saying by the AFP news agency. 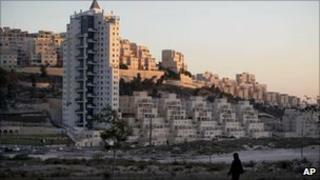 The Interior Ministry said that final approval had been given for almost 1,000 new homes in the East Jerusalem settlement of Har Homa, near the Palestinian town of Bethlehem, and about 300 in an area called Ramot. A ministry spokeswoman told the BBC that the plans were being published to invite public comment and that actual construction was likely to be years away. East Jerusalem is regarded as occupied Palestinian territory by the international community, but Israel says it is part of its territory. Israel has been urged by many foreign governments, including the United States, to resume a partial building freeze in settlements on the occupied West Bank and to maintain an unofficial status quo in East Jerusalem, in order to help faltering peace talks with the Palestinians. The news that more than 1,000 new homes have been approved in East Jerusalem could cast a shadow over a visit to the US by Mr Netanyahu, says the BBC's Wyre Davies in Jerusalem. US state department spokesman Philip Crowley said the White House was "deeply disappointed" by the announcement and viewed it as "counter-productive" to efforts to resume direct talks. He said Secretary of State Hillary Clinton would bring the matter up in a meeting with Mr Netanyahu in New York on Thursday. Israel angered the US administration earlier this year when a similar announcement was made during a trip to Jerusalem by US Vice-President Joe Biden. Mr Biden and other US officials are holding meetings this week with the Israeli leader about ways to resume the peace talks - and peace campaigners say the latest announcement from the Israeli government is deliberately provocative, our correspondent says. In New York, UN secretary general Ban Ki-moon "expressed concern at the resumption of settlement activity and recent announcements of further settlement construction in East Jerusalem," the UN press office said. The Palestinians have refused to go back to the negotiations - which resumed in Washington in September after a break of almost 20 months - without a stop to building Jewish settlements on the territory they want as their future state.